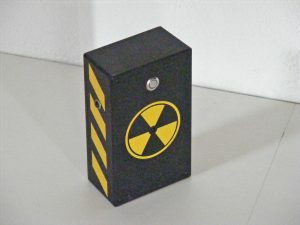 Bomb – A black box which has to be planted near a specific target and armed. Opposing team has 2 minutes to find and disarm it. Hospital – This is the place where all ‘dead’ players need to go to ‘come back to life’. Each team should have a hospital in their base. Every 30 seconds hospital sends a signal which gives players full health and ammo. Signal is automatic, there’s no need to press the button. Shooting to and from the hospital is forbidden! Control Point (CP) is equivalent of ‘capture the flag’ in ASG/Paintball games and the main target in most scenarios. 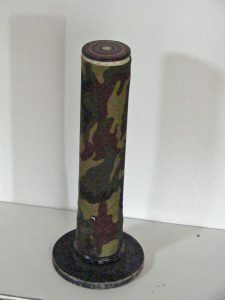 To take control of the point, players need to ‘shoot’ into the tube from the top (receiver is hidden inside the tube, so cannot be shot from distance), the tube will shine the colour of their team. If the enemy manages to score a hit, it will shine their colour. When programmed time pass (counting from the first hit), the tube will start flashing the colour of the winning team, and won’t take any more hits. Standard time is 10 minutes, but can be set up 2-30 minutes. Beacons are used as strategic targets, which have to be found and destroyed (or protected). Standard setting is 2,500 health points (so 100 hits to destroy). Beacons can be programmed to react to hits from specific weapons only (when one of the rifles acts as RPG) or to explode when destroyed. Warning: beacons do take hits from friendly fire! 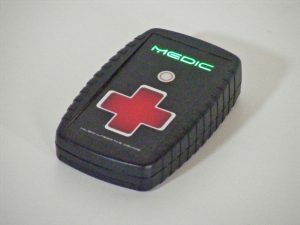 Medic Kit – One player in each team can act as medic and give a bit of health to the wounded mates (wounded, but not dead) In standard setting medic kit contains 50 portions of 10 health points each. 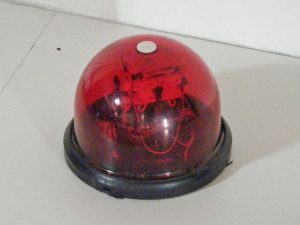 Medic must hold the button for 5 seconds in front of wounded person’s receiver. The light on the kit indicates remaining level of „health”: it turns from green to yellow (below 50%) red (below 25%) and dimmed red (empty). Hostage/VIP – The headband is not connected to any weapon. Useful when you have to transport a VIP safely from one point to another, or when you need to capture somebody alive. Warning: hostage takes hits from all teams, even when friendly fire is switched off!